Well designed streets, parks, open spaces, public places and buildings facilitate human connectivity and improve people’s mental, physical and social health. As planners and landscape architects, KTUA is focused on the principles of healthy placemaking – a collaborative process for reshaping the public realm of our neighborhoods, communities and regions. The link between our natural and built environments and the health of individuals, families and communities is real. Sr. Associate, Joe Punsalan, reviewing documents. Nunc pretium ex a dignissim. Established in 1970, KTUA has expanded the boundaries of the traditional landscape architecture practice by incorporating land use and transportation planning, community planning, federal planning, resource management and visualization practices into our portfolio. Two young landscape architects had a vision for design in San Diego – and Kawasaki Theilacker & Associates was founded in 1970. Frank Kawasaki and Michael Theilacker were awarded 25 projects in that first year, including residences, apartment complexes and shopping centers. 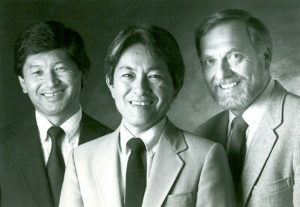 Don Ueno joined the firm in 1971 and the firm won numerous commissions for parks, student housing complexes and waterfront promenades. Among these projects, Palm Canyon in Balboa Park continues to amaze visitors with its stately trees and wood engawa – a testament to the firm’s sensitivity to design. The guiding principles that Frank, Michael and Don built their practice on – collaborate with your clients to allow them to realize their vision; respect the natural environment and enhance the built environment; and treat your staff like family – are still the foundations of the firm as we transition to the third generation of landscape architects and planners. In our vision and our actions, KTUA collaborates with our community leaders, public agencies, private developers, allied professionals, neighbors and families to develop implementable plans that address social, physical, environmental and economic goals that shape healthy places. By building support for these plans and projects from the ground up, we provide opportunities for civic engagement and transformative ideas. The diversity and background of our staff, a collaboration of planners, landscape architects, GIS analysts, facilitators and graphic artists, allows us to fully understand the larger perspective and implement the fine-grained details that contribute to project success. All of our staff members, from the principals to the designers, are hands-on. The team that is working on your project will stay in place from start to finish, ensuring that transitions from one phase of a project to another will be seamless and efficient. KTUA staff members are involved in their communities, from community planning groups and advisory boards to philanthropic groups and student mentoring programs, with the goal of effecting positive change in our neighborhoods. KTUA staff members are frequent speakers at the local, regional and state level on the benefits of forward-thinking planning and design on people, the community and the environment. KTUA’s office is located in a very walkable and bikeable neighborhood by choice, with a goal of more bikes on the bike racks than cars in the parking lot. KTUA is a Gold Level Bicycle Friendly Business as designated by the League of American Bicyclists. KTUA’s efforts to promote planning and design projects that focus on healthy placemaking have been recognized by our professional organizations such as ASLA, APA, ULI, APWA and SAME.